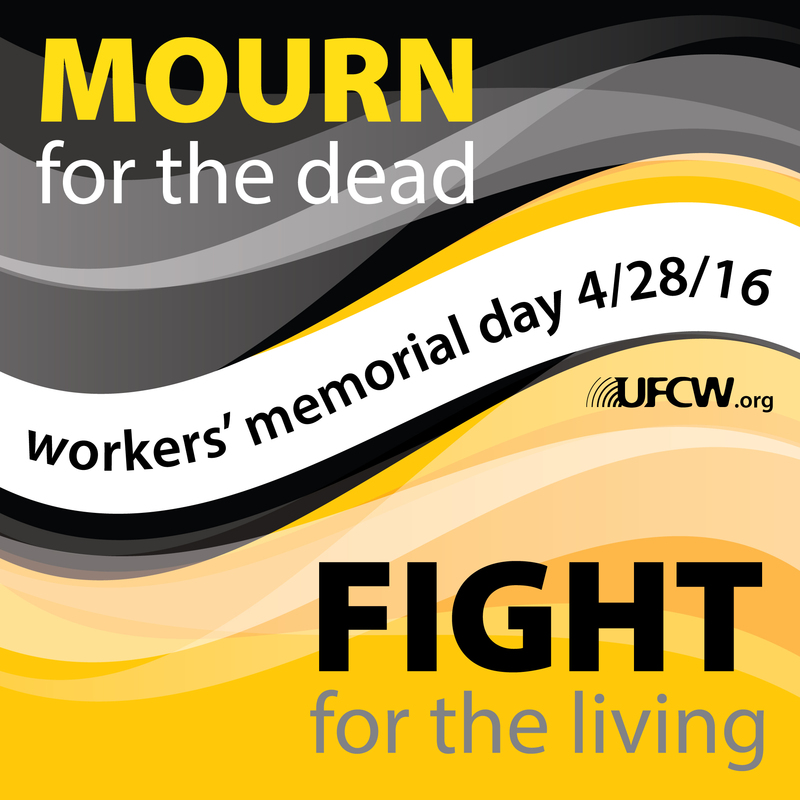 On April 28—Workers’ Memorial Day—the UFCW will join workers in the U.S. and around the world to remember those who have suffered or died on the job and renew the fight for safe jobs. Workplace fatalities have increased. In 2014, there were 4,679 workplace fatalities in the U.S., which is an increase of 2 percent over the 4,585 workplace fatalities in 2013. Fatal work injuries increased in the following industries: mining (up 17 percent), agriculture (up 14 percent), manufacturing (up 9 percent), and construction (up 6 percent). Workplace fatalities resulting from falls, slips, and trips have increased. In 2014, fatalities from falls, slips and trips in the workplace increased by 10 percent to 793 in 2014 compared to 724 in 2013. Women and older workers are vulnerable. Workplace fatalities for women increased by 13 percent in 2014. Fatal workplace injuries involving workers age 55 and older increased by 9 percent to 1,621 in 2014 from 1,490 in 2013. Self-employed and temporary workers are at risk. Workplace fatalities involving self-employed workers increased 10 percent in 2014 from 950 in 2013 to 1,047 in 2014. In 2014, 797 workers killed on the job were identified as contract workers, 6 percent higher than the 749 fatally-injured contract workers reported in 2013. Fatal work injuries among foreign-born workers and non-Hispanic white, black or African-American, and Asian workers have increased. In 2014, there were 827 fatal work injuries in involving foreign-born workers, representing 80 different countries. Forty percent of these workers were born in Mexico. Millions of workers continue to suffer from injuries and illnesses at work. In 2014, nearly 3 million nonfatal workplace injuries and illnesses were reported by private sector employers, and 95 percent (or 2.8 million) were injuries, the majority of which occurred in service-providing industries. Injuries and illnesses related to musculoskeletal disorders and falls has increased. The rate of falls in private industry increased to 16 percent compared to 15 percent in 2013. Musculoskeletal disorders accounted for 32 percent of all injury and illness cases in 2014. Injuries and illnesses for women remain high. Women accounted for 39 percent of illnesses and injuries in 2014, and women had higher incidence rates compared to men in cases associated with workplace violence, falls and repetitive motion. Days away from work due to injuries and illnesses has increased. On average, workers took 9 days to recuperate from workplace injuries and illnesses, which was one day more than reported in 2013. In 2015, OSHA received reports of 610 severe injuries and 291 amputations from the food manufacturing industry. Grocery stores reported 215 severe injuries and amputations.